Beaches and river shorelines all over the world are at risk from oil spills. Spills are most likely to occur while oil is transported or transferred between oil tankers, barges, pipelines, refineries, and distribution or storage facilities. Spills may also occur during natural disasters (such as hurricanes), or through deliberate acts by countries at war, sunken ships, vandals, or illegal dumpers. Oil spill risk is a function of consequence and probability. Spills from tankers for example may have a low probability of occurring due to efforts to prevent spills, but are high consequence events when they do occur because of the type of oil and huge volume that could be spilled. By contrast, spills from oil terminals may occur more frequently (high probability), but may be low consequence events because of the smaller volume being stored or transferred. Oil spill risk changes over time. Today, tank ships are constructed with double hulls to reduce the risk, while they are built to carry larger and larger volumes of oil. In other words the beach disaster is less likely but if it occurs it will be larger. Eco-tourism takes vessels into formerly remote areas of the world, such as the Antarctic. Around the world our pipelines are aging yet are becoming a larger source for oil movement. In certain areas our oceans, especially in the South Pacific, sunken ships from past wars are beginning to lose their integrity and release oil. The intensity of storms around the world is changing and the threat to our offshore drilling facilities is increasing. An unknown amount of oil was released throughout Hurricane Ike in September of 2008 as it struck Galveston Island in the United States. An ounce of prevention is worth a pound of cure for our precious and valuable marine environments. Preventing all spills may not be an attainable goal but prevention can certainly reduce the frequency and severity of spills. Prevention activities include thorough training of people, proper equipment maintenance, adequate staffing and limiting work hours, internal and independent auditing of oil practices, company policies and cultures that focus on prevention. Spills cannot entirely be prevented so the second line of defense is preparing for the possibility. This means developing an active “culture of preparedness” for continuous improvement and initiative rather than reaction. Preparedness perfects response and fights complacency. Requirements to report spills to government agencies. Pre-staging equipment and training professional response personnel. Drills to test the plans and then uses lessons learned to strengthen the plans. Computer modeling to understand trajectories of spoiled oil, fate & effect in the environment. Involving beach communities in planning is important. Sometime tradeoffs have to be considered. The concept of balancing environmental risk and sensitivities against socio-economic factors (e.g. fisheries, tourism) in order to determine the most appropriate techniques and level of cleanliness (sometimes referred to as “net environmental benefit analysis”) is well known and widely accepted. One of the most significant factors in any spill is the type of oil spilled, especially its probable persistence on the beach and in the marine environment. Non-persistent oils include light refined products (e.g. gasoline) which are highly volatile materials with low viscosities. These oils tend to evaporate rapidly and because of the ease with which they disperse and dissipate naturally there is usually only a limited requirement for cleanup. Such oils may, however, pose a significant fire and explosion hazard as well as cause public health concerns if they occur close to crowded beaches or other places where people gather. They may also cause significant environmental impacts due to their high concentration of toxic components but, as these same components evaporate rapidly, any such effects will usually be highly localized. At the other end of the spectrum of oil types are heavy crudes and heavy fuel oils. These oils are highly persistent when spilled due to their greater proportion of non-volatile components and high viscosity. Biofuel Oils: Biofuel based oils are gaining in use and demand. Many non-petroleum oils have similar physical properties as petroleum based oil, their solubility in water is limited, they both create slicks on the surface of water, and they both form emulsions and sludge. In addition, non-petroleum oils tend to be persistent, remaining in the environment for long periods of time. Oil floats on water and very heavy oil can sometimes sink making it hard to collect. Oil spreads out rapidly across the water surface to form a thin layer called l an oil slick. In its thinnest form, it is called a sheen (often seen as rainbow colored). At the same time as it moves and fragments, it also undergoes physical and chemical changes, collectively termed weathering. Most of these weathering processes, such as evaporation, dispersion, dissolution and sedimentation, lead to the disappearance of oil from the sea surface. On the other hand, the formation of water-in-oil emulsions (“mousse”) and the accompanying increase in viscosity as the oil absorbs up to four times its own volume of water, promote the oil’s persistence. 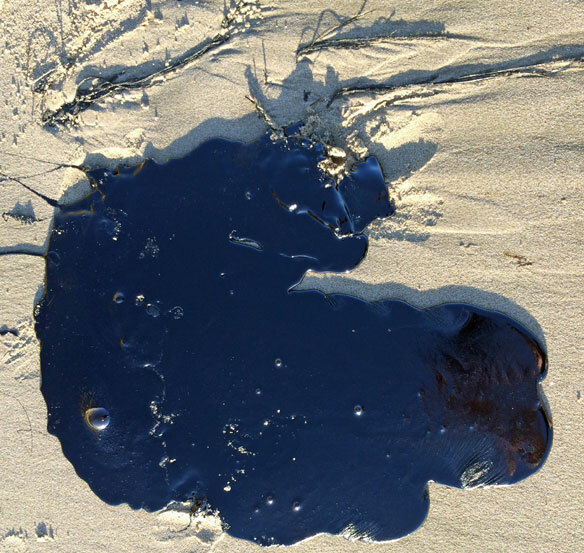 Oil can form emulsions or end up as tar balls and pats on shorelines or travel long distances at sea. Large oil spills can be very harmful to birds and marine mammals, fish and shellfish and all sorts of natural, cultural and economic resources. However, even a smaller spill may prove much more harmful than a larger spill if it occurs at the wrong time or season and in a sensitive environment. Mechanical recovery using booms, which are floating barriers to oil (for example, a big boom may be placed around a tanker that is leaking oil, to collect the oil or around sensitive areas to deflect the oil). On-water recovery using skimmers, which are used on boats to remove spilled oil from the water surface. Skimmers can also work from vacuum trucks, which can vacuum spilled oil off of beaches or the water surface. Sorbents, which are natural or synthetic materials used to absorb oil. Chemical dispersants and biological agents, which break down the oil into its chemical constituents but this may add pollutants to the sea floor. In-situ burning, which is a method of burning freshly-spilled oil, usually while it’s floating on the water. Washing oil off beaches with either high-pressure or low-pressure hoses. Or shovels and road equipment, which are sometimes used to pick up oil or move oiled beach sand and gravel down to where it can be cleaned by being tumbled around in the waves. Deterrence or scare tactics to keep wildlife from the spill area and Wildlife Rehabilitation stations where oiled wildlife can be rescued and cleaned. No response. Sometimes, people may decide not to response at all to a spill, because in some cases, responding isn’t helpful or even adds to the damage from the spill. a set of standard terms and definitions and documentation. Cleanup techniques depend on the type of beach, degree of exposure to waves and currents, and biological sensitivity. Learn more. Trash pollution and contamination of beaches and nearshore waters is a global problem. In the United States in 2006, water samples from 92 beaches in 19 different states exceeded public health standards for pollutants. Offshore sewer outfalls, faulty (or non-existent) septic systems, non-point source agricultural run-off and increased sedimentation from logging and agriculture are common problems. Recently, beach nourishment (pumping sand onto the beach) has become a major source of fine sediment pollution (southern Spain, southeast Florida), causing harm to many nearshore ecosystems, particularly hard grounds and reef. Discarded trash can become a component of nonpoint source pollution runoff. Plastics, metals and other types of trash often harm animals and plants. Plastics and metals degrade very slowly over time and can leach harmful chemicals into the environment. These materials can also contribute to the transmission of disease. In addition, trash simply degrades the beauty of an area. Runoff is also a major problem. Urban areas with large numbers of automobiles, trucks, and large transportation systems are major sources of oil based pollution into soils and paved surfaces. Rain washes surface pollutants to streams where they eventually course towards the oceans. Degraded water quality affects coastal ecosystems.